The music of Estonian composer and Orthodox Christian Arvo Pärt—considered “spiritually powerful” by a large and widely diverse audience—provided the basis for an exploration of the relationship between sound and the sacred at an international conference in the heart of NYC’s arts scene, May 1–4, 2017. Musicologists, art historians, performance artists, experts in architectural acoustics, and renowned scholars and theologians gathered for the event, titled, “Arvo Pärt: Sounding the Sacred,” at McNally Amphitheater on Fordham University’s Lincoln Center Campus. Krista Tippett, host of “On Being”—a Peabody Award winning radio show that explores some of humanity’s oldest philosophical questions—presented a faculty seminar and public lecture on our campus on May 25, 2017. Funded by a grant from the Henry Luce Foundation, these events were arranged by Professor Peter C. Bouteneff, director of the Sacred Arts Initiative at St. Vladimir’s, in an effort to explore ways to engage the wider culture in conversations about faith and spirituality. 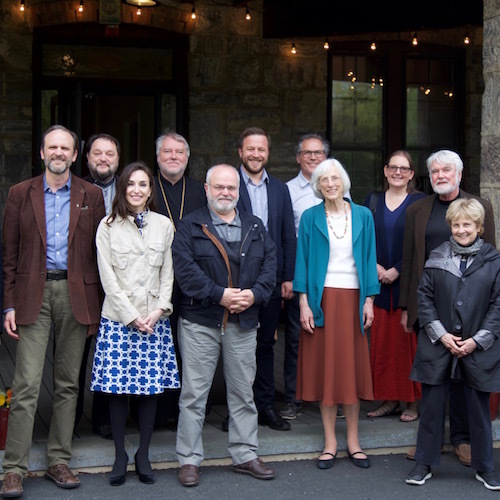 Eleven conference speakers gathered on the campus of St. Vladimir’s Seminary from September 14-16, 2018 to explore the theme of “Byzantine materiality” in preparation for the public “Byzantine Materiality” conference to be held May 8-11, 2019. Topics of discussion included Byzantine and ancient theories of matter and form; the use and significance of materials such as wood, stone, gold, and glass in ecclesiastical and other contexts; the roles of matter and materials in the Eucharist, icons, relics, and reliquaries; the rite for consecrating a church; sensory experiences of liturgy; and the neuroscience of viewing icons. Popular descriptions of Byzantium often emphasize the mystical and immaterial while overlooking the mediating role of matter implied by the Christian belief in the incarnation. At the same time, scholars have historically prioritized questions of form, iconography, and meaning in their study of Byzantine art and architecture. But as technology makes the human experience ever more digital and effectively immaterial, scholars across numerous disciplines—including Byzantine studies—have begun reconsidering the significance of matter and materiality. “Byzantine Materiality” is a two-part interdisciplinary event of the Sacred Arts Initiative at St. Vladimir’s Seminary that explores matter, materials, and materiality in Byzantine art and culture. It aims to examine material strategies of objects, makers, and users; the agency and affective properties of materials and objects in sacred, political, and other social contexts; Byzantine depictions and descriptions of matter in images and texts (including poetry and hymnography, rhetoric, theology, etc. ); and sensual/embodied experiences of the sacred.